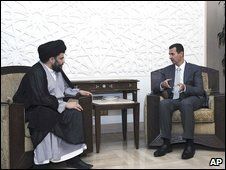 Muqtada al Sadr made a surprise visit to Damascus for talks with President Bashar Al Assad, the details of which were undisclosed. We can only guess at the nature of their discussion, but I imagine it was to convey some sort of message from Tehran concerning the latest concerted effort being made against Iran. Sadr is reported to have been residing in Qom for some time and the observant will note that around the time the riots began in Iran, regular bomb attacks against Sadr's areas have been taking place, timed with the US withdrawal from the major cities. In Iran, the Rafsanjani, Mousavi, Khatami triumvirate is still trying to muscle Ahmedinejad in a struggle which now threatens Khamenei himself. Naturally, Damascus and Hezbullah HQ will be anxious for a direct update on what is happening, especially with all the Israeli posturing that has been taking place recently. Although the Republic is distracted, I think it is still business as usual for its foreign operations. In Afghanistan Western forces are still losing men to IED's (Improvised Explosive Devices) and the two British hostages are still a card that has not been played in spite of the release of the five Iranian diplomats. It is not confirmed that Iran is behind this, but it would not be difficult to imagine some involvement, Helmand is extremely close to the Iranian border; IED's were a major gripe the occupation forces had with Iran in 2007, blaming the Revolutionary Guards with supplying the expertise and equipment necessary to construct sophisticated traps, especially in the south of Iraq. Previous to that Bush in 2007 had warned those who opposed his troops in Iraq to "bring it on", and if you remember the American casualty rate soared after that, only to be lowered once a deal was cut with the Iranians. Then it was covered by the silly American "Surge". Anyhow, that was then. So you think Iran really is playing a (military) role in Afghanistan and Iraq? Also, I think Obama is staying quiet on the Iranian upheavals because he knows how Bush repeatedly sided very overtly with foreign parties only to see them lose. Why? Because they were labelled foreign puppets. By the way, conspiracy theories aside, I think what is happening in Iran is actually quite healthy. There is a very public political debate. Ironically, that should teach the West that Iran is nothing close to being a dictatorship. Yes, I believe they have an influence with what is happening in both countries - especially in Iraq and I mean by that militarily as well as politically. Military support can be through logistics or training. Frankly, they would be crazy not to do so. There are American boots on practically every corner of their country. Well they are still being labelled as foreign puppets, I think Obama doesn't want to pull the United States into a standoff with Iran just yet on such issues. He's still getting to grips with this enormous machine he's in control of. But we will see what he does soon enough. Also, there is no conspiracy theory in my opinion. You have Rafsanjani, who does not like Ahmedinejad or Khamenei, thinking he has a real shot at muscling them out and his allies Mousavi and Khatami form up behind him. I think the England and Europe might have a hand in some way, at least in providing support or encouraging what is happening, I mean why would they not want to? Let's see what happens, Sadr's visit to Syria is so clearly telling us that he has something from Tehran to convey to Damascus and Hezbullah. Maybe a reassurance, maybe marching orders. The Syrians know now that the Iranians and Hezbullah can deliver the goods if all goes to plan. The wildly happy President Assad we saw at the end of the 2006 war where he ecstatically announced "we won" was the pleasant surprise of a young man who might not have been sure he had placed his bet on the right horse but then felt he was vindicated in his decision. Good for him, he has good advisors and Walid al Muallem is probably one of the best foreign ministers Syria has ever had. The guy is a political animal and I have nothing but admiration for his style.